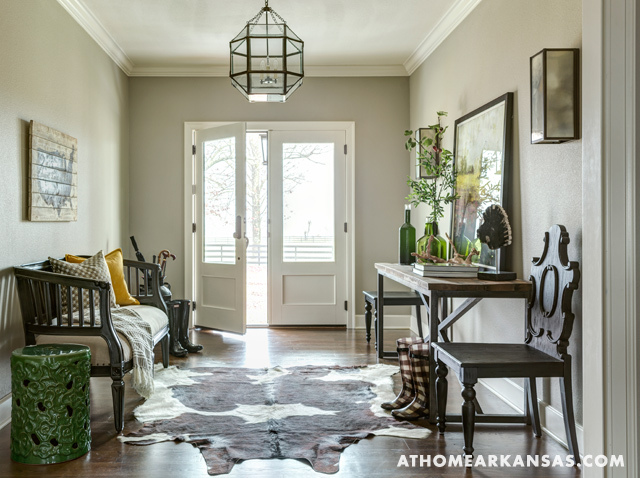 When it came to the renovation of their home, three things emerged as top priorities to the owners of this house on the outskirts of Sheridan: their family, the view of the farmland surrounding their property, and the overall functionality of the house. However, a total renovation wasn’t the original reason the couple called on architect Carolyn Lindsey and contractor Greg Dunlap. 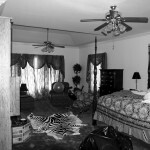 Initially, they simply wanted to change out the home’s windows, doors, and flooring. “Once we started talking with [the homeowner], he told us that nothing had been done to the home since he moved in more than 20 years ago,” Lindsey explains. Ideas began to flow, and everyone involved quickly realized this was going to be a bigger project than the original “few updates” requested. 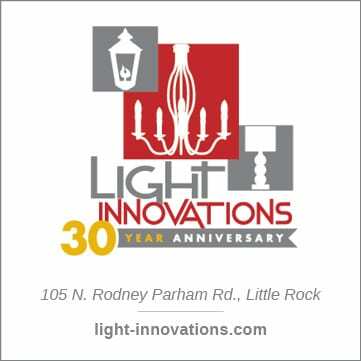 “They really needed advice on everything from new paint colors to furniture, so that was when we brought in Brittany,” Lindsey says of the addition of interior designer Brittany Nixon to the renovation team. 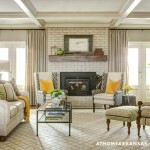 With a constant flow of family and guests, the home needed to feel comfortable and usable. What’s more, the structure itself needed improvements that would allow everyone to gather in the common areas and also to move easily about the space. 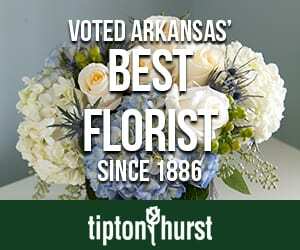 Inspired by the lush green land just outside the home’s walls, as well as the owners’ collection of Western and rustic-inspired art and accessories, Nixon, Lindsey, and Dunlap set out to turn the couple’s vision into a reality. 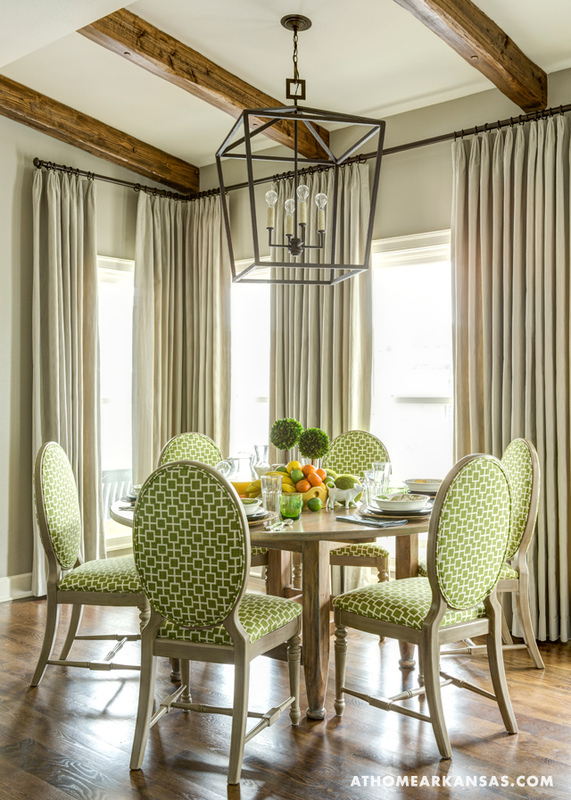 Request: Infuse the home with more light and a palette that matched the home’s environment. 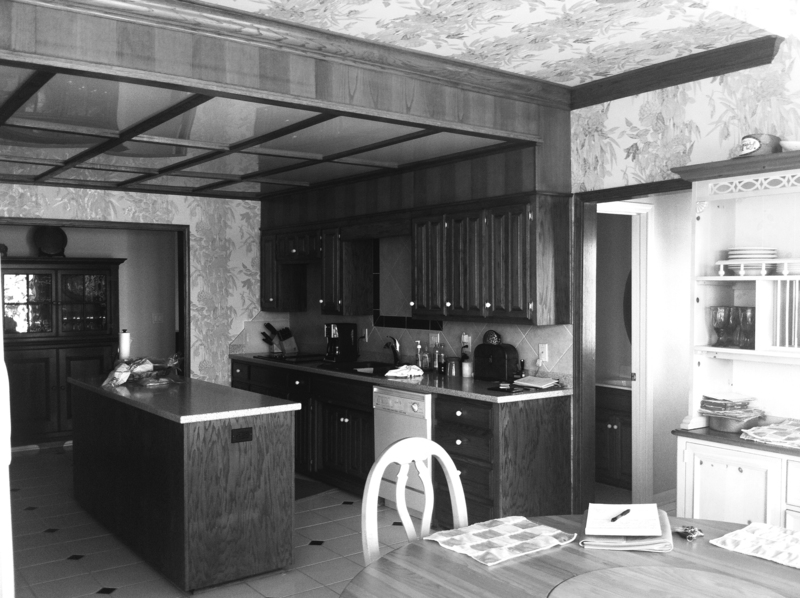 Result: “Previously, the kitchen and living space were separate rooms, both with dark, stained-wood finishes. 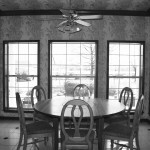 We brightened up the living space by removing the paneling, and took down the wall between the two areas to let the light pour in from the breakfast room’s windows,” Lindsey explains. 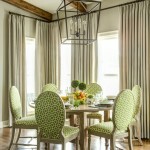 When selecting paint colors and fabric swatches, Nixon turned to the landscape for cues. 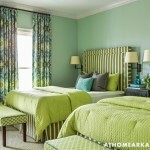 “Tying the elements of the outside to the inside was hugely important, and this is reflected in the color scheme. In the spring and summer, you can see the correlation between the colors. 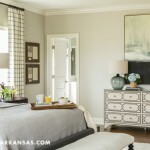 Without it being literal, I was trying to connect the two,” she says of the home’s palette, which includes shades of gray, blue, green, and white. 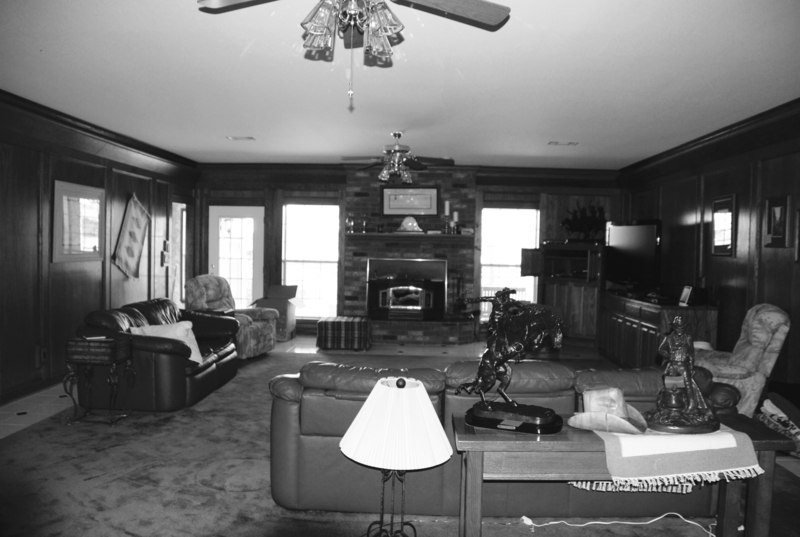 Request: Update the furnishings and furniture placement to reflect the owners’ casual, comfortable lifestyle. Result: Refurbishing key pieces the couple already owned brought the rooms up to date without replacing every item in the home. 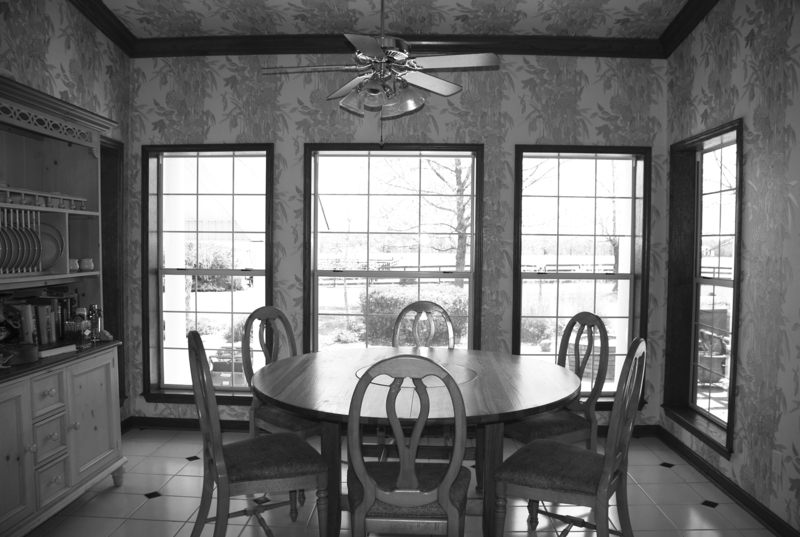 For example, the breakfast nook’s existing dining set received a facelift complete with a new finish and reupholstered chairs. 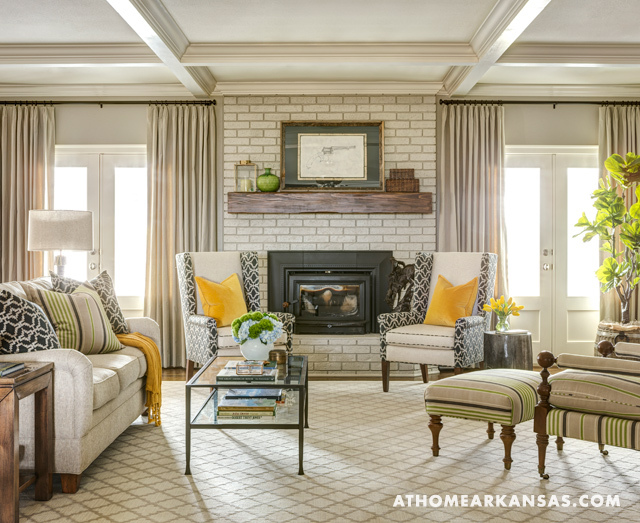 In the living room, multiple seating areas allow for a conversation space, chairs and a couch invite guests to watch television, and a separate nook at the far end can be used for reading—all within one space. Request: Eliminate the home’s compartmentalized spaces and give it a streamlined, cohesive flow. Result: Removing the expansive wall that separated the kitchen from the living area, created one large gathering space that allows the family to interact whether they are cooking dinner or watching a ball game. “Because they are so family oriented, an open floor plan was the first thing that came to mind when they started talking about how they envisioned being together and using the home,” Nixon says. 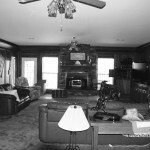 Additionally, a furnace was relocated, allowing for a hallway to create an opening between the dining room and kitchen. 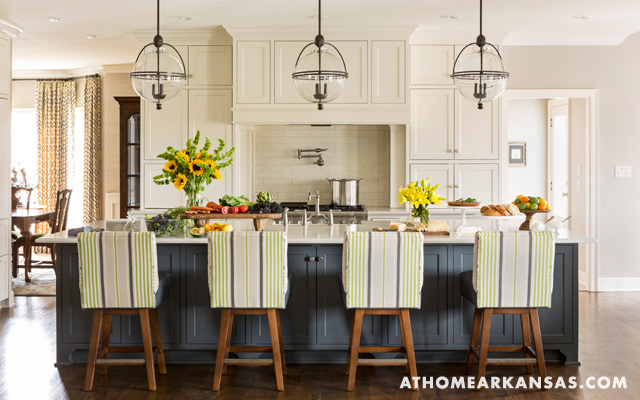 The dining room was previously a dead-end room, but moving the furnace and creating the walkway brought it back into the flow of the home—making it easy to cook in the kitchen and entertain in the dining room. Request: Make the kitchen more functional for cooking and dining, and create more storage space. Result: A large island was installed to serve as a defined work and eating zone. 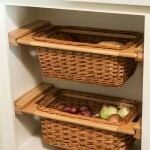 Its extra-deep construction provides the couple with more storage for serving pieces and cookware. Because the kitchen had only one wall for upper cabinets, Nixon and Lindsey used the space wisely by bringing the cabinetry surrounding the cooktop all the way down to the countertops. 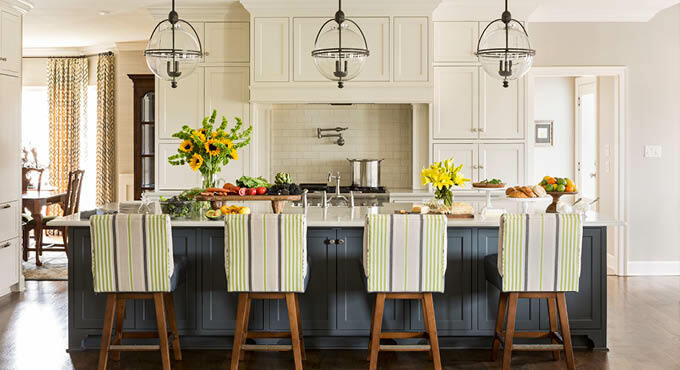 “When we open a kitchen up to the living room we like to provide a space for everything behind doors to keep the counters uncluttered,” Lindsey notes. 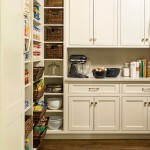 Large appliance garages hide a coffeemaker, toaster, and blender, while still keeping them close at hand. 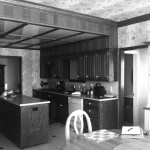 Perhaps the biggest change in terms of functionality was eliminating a home office that sat at one end of the kitchen. 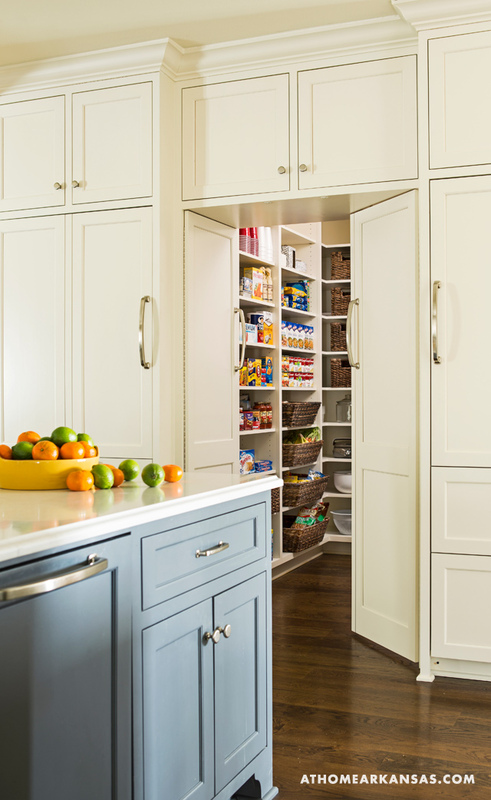 Nixon and Lindsey cleverly relocated the office’s necessities to the master bedroom and transformed this area into a concealed pantry that is accessible through what appear to be oversized cabinetry panel doors. 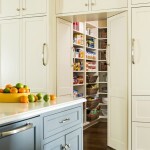 This entry blends seamlessly with the panels on the full-size freezer and refrigerator, which are located on either side of the pantry entrance. 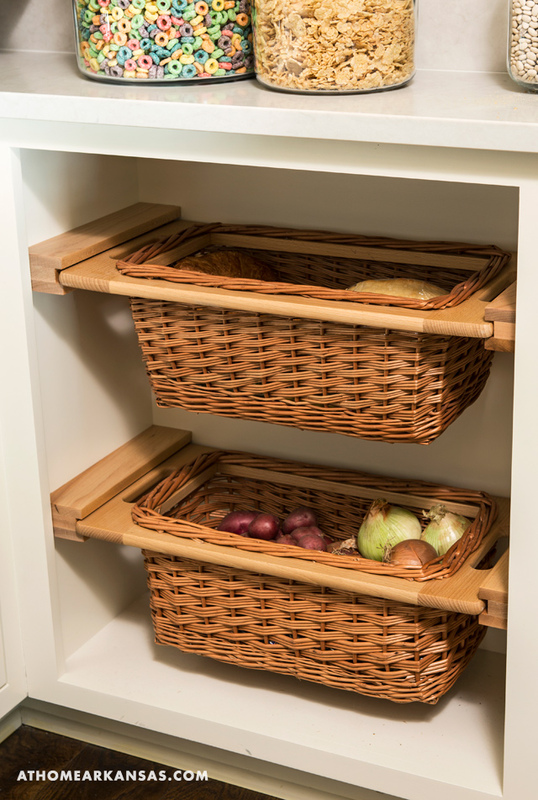 Storage was also maximized here: “The pantry is really large, so it becomes the overflow of kitchen, but it remains very concealed,” Nixon notes. 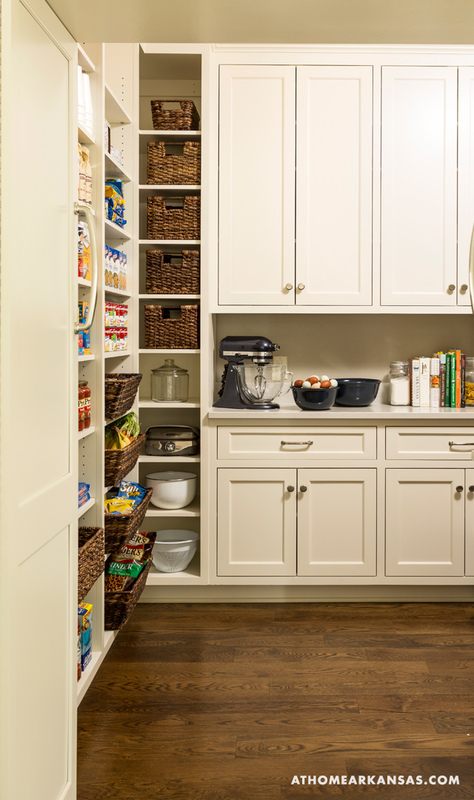 Incorporating a countertop inside the walk-in pantry also allows for a prep-work or baking station, adding to the convenience and efficient use of space. Request: Realign the master bedroom in a more symmetrical manner. Give it—and the adjoining bath—a style refresh. 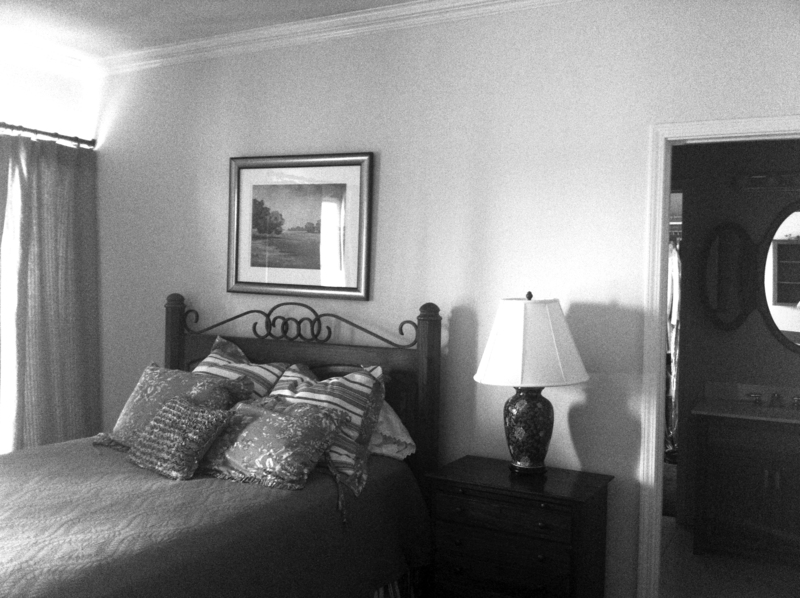 Result: Repositioning the bedroom’s windows allowed the bed to be centered on the back wall and for bedside tables to be placed near the windows on either side of it. Leveling off the room’s former tray ceiling makes the space feel less condensed. 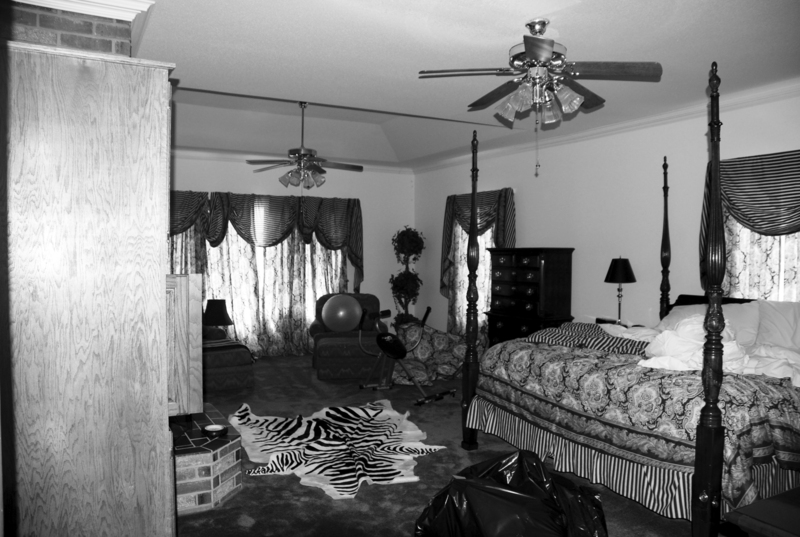 Additionally, the design team transformed the portion of the room near the back window from a sitting area into the couple’s office. 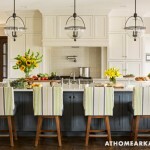 Streamlined, transitional pieces replaced a bulky furniture set. In the bath, the existing tub was given a facelift, and a new shower was installed. 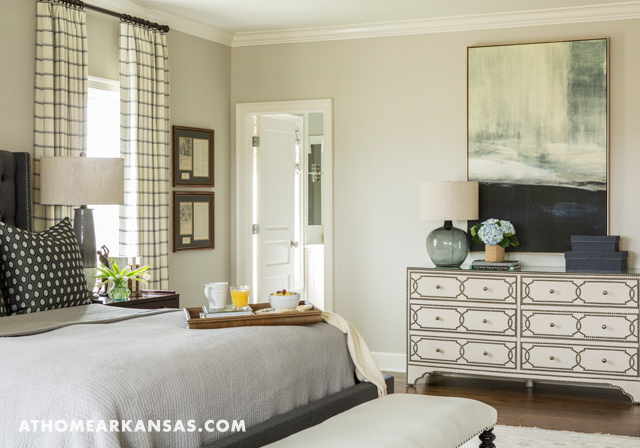 A brilliant white palette lends a clean, refreshing feel to the shared space. 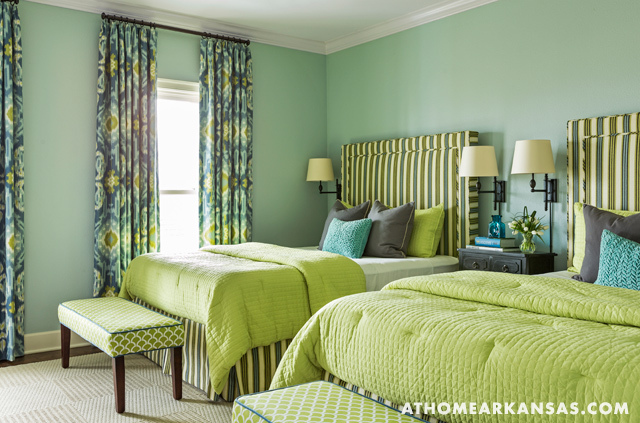 Request: Create cheerful guest rooms that can accommodate a crowd. 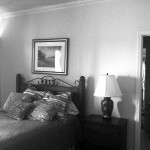 Result: The goal was to sleep as many people as possible in the house, since grandchildren and guests visit frequently. 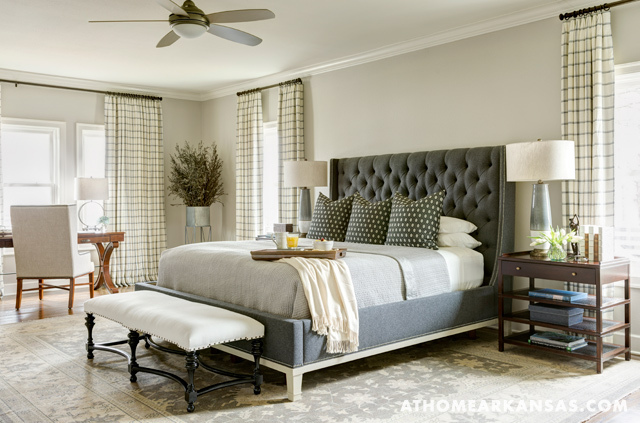 To do this, Nixon maximized sleeping space in one of the home’s two guest rooms by using two full-size beds that could sleep four people in one room. Several elements, including a punched-up version of the home’s color scheme and easy-to-replace FLOR carpet tiles, make it a top pick for the youngest visitors.